Thank to Pompeii we can follow the evolution of the Italic and Roman houses beginning from the IV - III century B.C. ; its more typical scheme is in the so-called House of the Surgeon where it is underlined, between few remakings, an original nucleus constituted by covered environments around the atrium (atrium or cavum ædium), an inner courtyard illuminated by a central opening in the roof. The inclination of the tiles looks towards the inside of the house to carry, through the central opening (compluvium), rainwaters in an underlying basin (impluvium), provided of two holes: one connected, through a small channel, with a cistern for the hoarding of waters, the other with the outside for the disposal of surplus waters. The atrium of the ancient Italic house, surrounded by tall boundaries like a fortitude, was the irradiation center of domestic life, the place where the pater familias had the meals sat around the table with the family and the slaves and where the domina sat to spin with the handmaids and provided to the family jobs. In the atrium, in fact, was the kitchen, that’s why it is supposed that from the smoke that blackened the walls of this environment it was called atrium (from ater, black). The enter to the atrium was through a hallway (vestibulum) and, behind the entry door, a sloping narrow corridor (fauces). The door of the entrance (ianua) was made of wood with two or more leaves (fores or valvæ) rotating on hinges on the threshold and on the lintel. At the sides of the fauce and the atrium there were small environments as bedrooms (cubicula) and two open spaces (alæ); diametrically opposite to the entry there was the tablinum, flanked by a narrow corridor (andron) that brought to the hortus and to one or two side spaces, with function of dining room, of store room or of kitchen. The triclinium appears in the Italic house together with the Greek custom of dining laid down; it was put usually in one of the side rooms of the tablinum. The triclinium table (cartibulum) was set at the center of three beds (medius, summus, imus lectus) to allow the stretched out guests to pose the dishes and to take the foods. ​The peristyle (peristylium) is the main element imported by the new Greek – Hellenistic architectural fashion ; around it some environments developed: the exedra and the oeci. The increasing of population during the empire and the lacking of lodgings, consequent to the damages provoked by the earthquake of 62 A.D., determined a vertical development of the houses; though Pompeii was a small town (but always knot of important commercial traffics), the Pompeian house continued to be perceived as a housing unity for only one family nucleus. 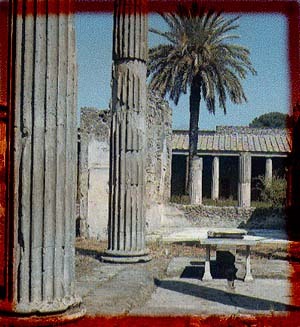 The inside of the Pompeian house was furnished with a few furniture; besides different types of chairs and stools we find many beds with different functions: a kind of sofa on which it was possible to lay down for studying (lectus lucubratorius), the bed for the triclinium table (lectus tricliniaris), and the one to sleep (lectus cubicularis). The heavy wardrobes (armaria) were leaned to earth, they had the shape of ours and were provided of keys and locks. For any object however, Pompeii offers such a conspicuous exsample and various like the one we have for heating and illumination: braziers, oil lamps, lampstands, candelabra, worked with notable artistic fancy in which it shined an Alexandrine style. Largely used for the kitchen furnishing were materials like the terra-cotta, the glass, the bronze: the employment of the metal was above all for casseroles, ladles, cups, strainers, ladles, while the terra-cotta was used for amphoras, mortars, funnels, buckets. 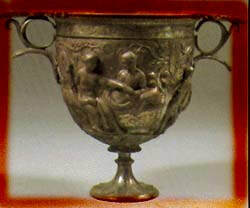 There are even examples of silver plate: wine glass, cups, trunk of cone cups, glasses, course trays, bowls, spoons. The day was divided in twelve day-time hours (hora prima, secunda, tertia, etc.) and twelve night-time; these last were divided in four periods said vigiliæ of three hours each, according with the turns of the sentinels. The three principal dates were: the Calends (the first day of the month), the Nones (the 5th of the month) and the Ides (the 15th of the month). The arrangement of the days in the weeks spreaded during the imperial age: the days took the name from the stars.